An aircraft in flight is airborne and subject to the movement of the air mass in relation to the surface i.e. the wind. The relatively low cruising speed of light aircraft makes them particularly affected by the wind velocity and consequently the calculation of the wind effect on aircraft velocity relative to the ground is a major part of light aircraft flight planning and navigation. Are we going to have a tail or head wind and how much? Are we going to drift left or right and how much? If you have a reasonable (ie ballpark) answer for those then you are well on the way to planning your flight time and fuel requirements. The effect of wind on an aircraft's movement is most easily understood and solved by vectors and vector triangles. A vector is an arrow with length proportional to the magnitude of some quantity, pointed in the direction it is acting. In our case where we want to determine the effect on wind on our aircraft, we use velocity vectors where the magnitude represents wind or aircraft speed, and direction represents their directions. We know that an aircraft in flight is airborne and consequently both the path it projects over the ground and its speed relative to the ground are the resultant of the aircraft velocity and the wind velocity. 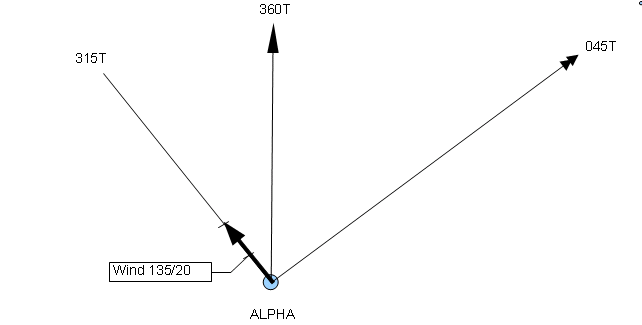 For example waypoint Beta is 150 nautical miles north-east (045T) of waypoint Alpha and an aircraft departs overhead Alpha for Beta, maintaining a heading of 045T while cruising at 75 knots. At the time the wind velocity at the cruise altitude is 135�/20 knots i.e. the 20 knot wind is coming from the south-east. Where will the aircraft be after two hours flight? Certainly not over point B as it will have moved 150 nm north-east within the air mass while the air mass has moved 40 miles north-west. So we might surmise that after two hours flight its position will be about 40 nm north-west of point B and this is shown below. The aircraft has drifted from its intended path or track over the ground and the track made good is about 15� to the left of the required track. We should note that, relative to the aircraft's course, the wind velocity normally has both a crosswind component and a headwind or tailwind component. Both these will affect the aircraft's speed relative to the surface � the ground speed. For the head or tailwind component that is easily understood- it is blowing with or against you. The crosswind effect is less intuitive, but it is making your aircraft cover more ground- albeit in the wrong direction- so your ground speed is generally increased. 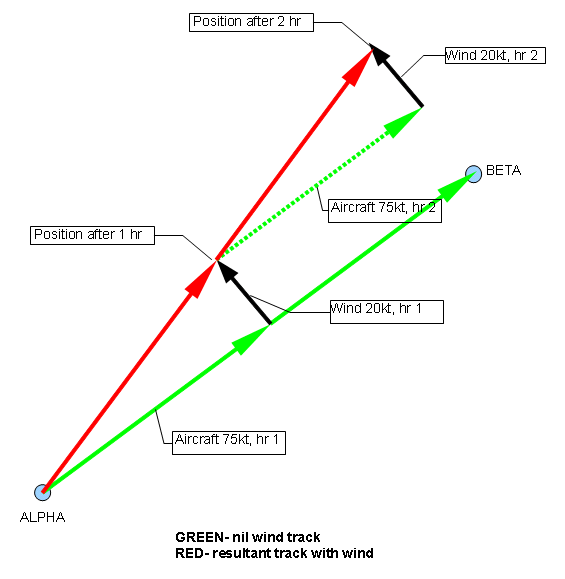 If we want to track over the direct route from Alpha to Beta we will have to determine the heading to fly that will provide the necessary crosswind correction angle to keep us on direct track. Remember that velocity vectors have both speed and direction. In the wind triangle we have some knowns, and two unknowns we want to determine. 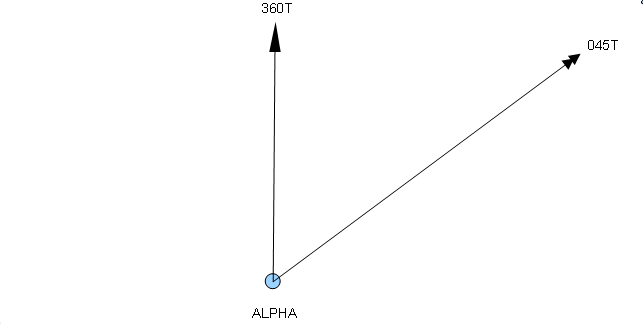 First draw a vertical line labelled true north and mark a position on the line as waypoint Alpha. 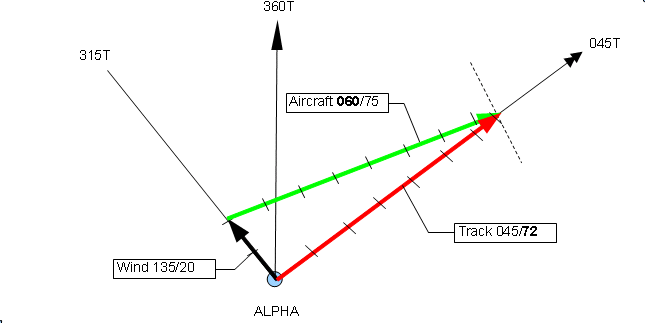 Using a protractor centred on Alpha and aligned with true north, mark the bearing to waypoint Beta e.g. from the above, 045� true. Rule a line of appropriate length from Alpha through the bearing, marking it with two arrows to indicate the track direction and annotate that bearing. Wind velocity is given as the direction the wind is coming from and we need to plot the direction it is moving to, the reciprocal bearing. The reciprocal is the stated direction �180�. Using a protractor centred on Alpha and aligned with true north, mark the reciprocal wind bearing, 135� �180� = 315� true. Rule a line of appropriate length from Alpha through the wind bearing mark. Decide the scale to be used and mark off a distance along that line that equals the air movement during one hour, i.e. 20 nm (20 knots wind speed). Annotate the wind velocity vector 135/20 knots. Using the scale, open up the dividers or compasses to the distance equalling the air distance the aircraft travels in one hour, i.e. 75 nm at the cruise airspeed of 75 knots. With one divider/compass point on the arrow of the wind vector, mark the track line with the other divider/compass point. Or just use the ruler to accomplish the same task. Draw a line connecting those two points, marking it with an arrow to represent the heading vector. Its orientation with true north is the heading (060�T) and its length is the TAS. Thus we have the first unknown, the direction in which to point the aircraft. Annotate the heading (060�T) and TAS (75 kn). Also note the wind correction angle [WCA], the difference between the track and the heading, 15�; and that the drift will be to the left, port drift if you are of a nautical bent. 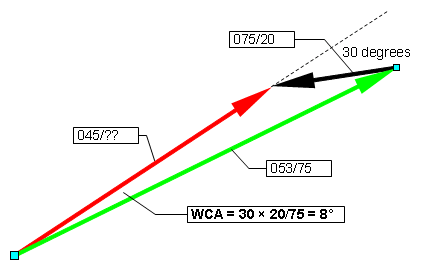 The wind correction angle is the angular difference between the required track and the heading, intended to ensure that the track made good will equate with the required track. Note that the terms 'crab angle' and 'drift angle' are very often used in lieu of 'wind correction angle' but the latter term is more precise, crab angle and drift angle do have slightly different meanings or associations. Drift angle is measured in flight, being the angle between the heading and the track made good. Crab angle is the preferred term when associated with crosswind landing. Now measure the distance between Alpha and the tipof teh aircarft vector, which is the distance (72 nm) moved over the ground during one hour � the second unknown, the ground speed. 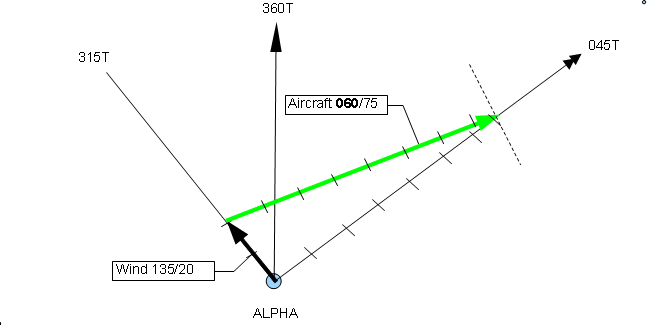 Annotate the ground speed (72 kn) adjacent to the bearing. We can now calculate the sector flight time from overhead Alpha to overhead Beta; this time is called the estimated time enroute or ETE. ETE = Distance (nm) / ground speed (kn = 150/72 = 2:05. It is interesting to note that even though the wind was a full crosswind the ground speed is less than TAS and thus the ETE is a bit greater than you may have expected. This is because the heading of 060� would now include a small headwind component. Plotting the wind vector triangle is the most accurate method for ascertaining heading and ground speed but there are two other methods which are quite accurate enough for light aircraft cross country navigation. The question with wind triangle plots is that you start with the assumptions that the forecast wind velocity is accurate, the aircraft's magnetic compass is accurate and the pilot will maintain a constant heading in flight. However there will be considerable variability in each so there is no reason to try for absolute accuracy in the initial calculation of heading, ground speed and ETI. We can introduce a few shortcuts to the process by using some simple mental arithmetic to estimate the crosswind and headwind/tailwind components of the wind velocity relative to the required track, rather than plotting the wind triangle. Even so it is wise to become familiar with plotting the wind triangle as the experience makes it much easier to mentally picture the relationship between the vectors, thus avoiding flying entirely in the wrong direction, which is remarkably easy to do. The 1-in-60 rule states that a 1 degree angle is approximately 1 unit offset for every 60 units along. For example, if you are 5 degrees off heading, you will be approximately 5NM off track after travelling 60NM. This rule is accurate enough up to about 45 degrees. To estimate the ground speed deduct the (acute) angle at which the wind meets the track from 115 (for angles up to 60�, use 105 for greater angles) and apply that as a percentage of the wind speed. Subtract the result from TAS if wind coming from ahead to abeam, otherwise add. You may think it wrong that if the wind is at 90� to the track (example B) the ground speed calculation will still come up with a headwind component. This is because you will have to crab into wind to hold track, so there will be a headwind component on you, thus slowing your ground speed. All the techniques described are not ultra precise but they are quite OK for all normal cross country navigation. There are several 'do everything' circular slide rules, or 'whiz wheels', marketed for aircraft flight planning usage. These navigational computers also incorporate a wind disc for the solution of the wind triangle. They too find the wind triangle solution by breaking the wind velocity into the crosswind/headwind components, rather than plotting a full wind vector triangle. You will find them very useful on the ground but some can be difficult to read and adjust in a light aircraft, particularly in an open cockpit. You may have enough difficulty just handling the chart, the flight plan notes and a pencil. The Jeppesen CR2 is OK and will fit into your pocket � together with a small folding rule � and can be operated with one hand for time and distance calculations. E6-B calculations is now a generic term for all the calculations associated with tracks, TAS, wind velocities, headings, groundspeeds, density altitude, time, fuel, weight and balance and so on. The term derives from the model number of an older instrument, consisting of a pair of parallel rulers incorporating a rotatable compass rose, which was designed for laying out plots and wind triangles on charts. There are hand held E6-B calculators or computers which do much the same job as the whiz wheels. There are also E6-B software utilities for iPads, smartphones and tablets readily available for about US$20 � or possibly as freeware. However for basic map-following pilotage in New Zealand, where there are plenty of land features to monitor track and drift drift, the simple estimates for WCA and groundspeed are generally sufficient for flight planning, where the most important issue is the effect of wind on groundspeed and therefore flight time and fuel burn.